Acer today introduced the latest Intel® RealSense™ short range camera to its top-of-the-line “Black Edition” Aspire V Nitro notebooks. As the world’s first to feature the new and improved camera, the Aspire V Nitro Black Edition offers gamers improved experiences with its enhanced 2D and 3D image quality, allowing gamers to broadcast their gaming experiences and video chat with background removal. The new Intel RealSense camera offers an improved sensing range, more precise gesture tracking, control and object recognition. We believe the latest Intel RealSense camera will unlock new experiences for power users, complementing the style and performance of our iconic Aspire V Nitro series. Acer today introduced the latest Intel® RealSense™ short range camera to its top-of-the-line “Black Edition” Aspire V Nitro notebooks. As the world’s first to feature the new and improved camera, the Aspire V Nitro Black Edition offers gamers improved experiences with its enhanced 2D and 3D image quality, allowing gamers to broadcast their gaming experiences and video chat with background removal. Coming soon, gamers will also be able to customize their game experience by scanning their face and putting it on their favorite game’s character and scanning objects to place in their own game modifications. Available on both the 15-inch and 17-inch Aspire V Nitro Black Edition notebooks, the new Intel RealSense Camera offers an improved sensing range of up to 4.9 feet from the device and more precise gesture tracking, control and object recognition. The camera also enables a smooth Windows Hello experience on the notebooks, Microsoft's new biometric authentication system for logging into Windows 10. While using it as a regular 2D camera, it can operate at HD resolution at 60 fps. With the Intel RealSense Camera in place, Aspire V Nitro owners are able to use their notebooks more intuitively and make their gaming experiences immersive and personalized. It also enables 3D scanning and printing; users can simply scan an object with the 3D camera and save it. The 3D model can be used as a photo or altered for output on a 3D printer. The Aspire V Nitro Series notebooks are designed for those seeking an immersive gaming and collaboration experience and serious computing power. Powered by 6th Gen Intel® Core™ processors for ultimate performance, the Black Edition models support NVIDIA® GeForce® GTX960M graphics with up to 4GB GDDR5 graphics RAM and lightning-fast NVMe PCIe SSDs, which are typically only available in enterprise servers. The new models inherit the neat-cut corner design and breakthrough slot-antenna design introduced in the latest iteration of the V Nitro series. The antenna is discretely positioned on one corner of the display, ensuring 360-degree wireless coverage with no dead zones. Acer True Harmony Plus with Dolby® Audio™ technology helps the four built-in speakers pump out powerful surround sound for gaming, film and music playback. The premium “Black Edition” models include a distinctive light bar alongside the hinge, 4K 100 percent Adobe RGB options, and AeroBlade thermal exhausts with the world’s thinnest metallic blades of just 0.1mm thin, which are stronger and quieter. 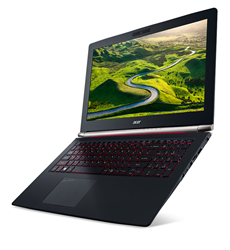 The Acer Aspire V Nitro Black Edition series featuring the new Intel RealSense 3D Camera will be available in North America starting in February at prices starting at $1,099. It will also be available in Europe, the Middle East and Africa in February with prices starting from €1,299. Exact specifications, prices, and availability will vary by region. To find out about availability, product specifications and prices in specific markets, please contact your nearest Acer office or retailer via http://www.acer.com.